Save $10 off at Bob’s Stores using this cell phone coupon today! Here’s the details about this Bob’s Stores Coupon. All you need to do is bring up the image on your phone and show it to the cashier to save $10 off any purchase of $50 or more at your local Bob’s Stores. In case you have any issues with the image, the coupon number itself is simply 105196. You can tell the cashier this coupon number and they can then use that to register the coupon in the computer system. We all know how annoying loading images on your phone can be, so this is a great thing to know in the event the coupon image won’t appear on your phone. 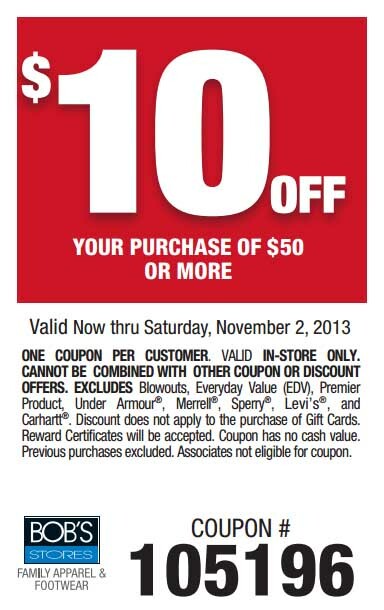 You’ll get $10 OFF from now to Saturday, November 2, 2013. Like usual, in-store only coupon available valid per purchase per person. And no combining with other discounts or offers including the Blowouts, Everyday Value, Premier Product and assorted brands listed on the coupon itself. And finally, you are not able to use the coupon as a store team associate. So get into a Bob’ Store today and save $10 using this coupon!